Why are my pages locked from editing? 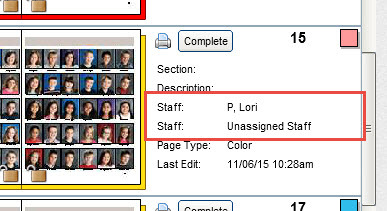 Pages in COMPLETED or SUBMITTED status cannot be edited. The difference is who can place these back IN PROGRESS. If a page is SUBMITTED (black border), you must call our office and speak to a rep, since there are no buttons available to click. We'll need to do a little bit of research to see where this page is in the production cycle. To be safe, only click SUBMIT when your entire book is finished and you're ready to turn it in for us to print. If a page is COMPLETED (green border), anyone with an Adviser role can click RETURN next to the page thumbnail. The page will be marked back to IN PROGRESS status. On the page in your Page Designer, check to see if the element(s) have a little gold "padlock" where the orange ball handles should be. If so, the elements are locked using the Padlock icon from the Page Designer icons menu. To unlock any or all elements, highlight the element and click the Padlock button. The padlock toggles on and off. 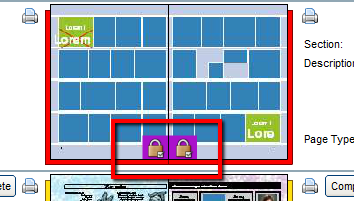 You can lock pages on the Page Ladder so they cannot be edited in the Page Designer. The bigger padlocks at the top and bottom of the pages mean the page lock is from the Page Ladder. You will not be able to COMPLETE or SUBMIT pages on the Page Ladder if they are locked with the padlock. Adviser roles can assign pages on the Page Ladder so they cannot be edited in the Page Designer by other staff members. Advisers can assign up to two staff members per page, but when pages are assigned, only those named users will be able to edit the page. Adviser roles can always edit a page. 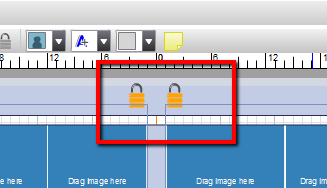 You will see the large padlocks on the Page Designer page and a brief message will show that there are no editable pages when an unassigned staff member tries to edit the page. No page lock will show in the Page Ladder.